A whole page dedicated to the Japanese brand IMA and their diving hard lures. Why? Because IMA seems to do a lure for all kinds of locations and conditions, and I feel so confident fishing with them. Bass love them! This little IMA iBORN 98f Shallow lure (98mm, 13g) casts really for its size, and on a medium speed retrieve it comes to life just under the surface with a very intense little slalom/wiggle sort of action. This is a very shallow-swimming lure and therefore doesn’t really like choppy conditions. You can find UK stocks of these lures here and here (Ebay link). I am not personally aware of a 125mm size lure that casts as far as this freak of nature, the IMA Hound 125F Glide (125mm, 20g, perhaps with a little rocket inside it ?). It just plain flies out in any kind of weather, and I have yet to find sea conditions in which it cannot grip down hard and keep you fishing. Oh, and it has a stunning action that bass love! The Hound Glide has been discontinued but I can’t live without it. Whilst the idea of lure copies doesn’t sit well with me, this Payo Perca 125 Mac Tune Floating Jerkbait (125mm 20g) is an outstanding alternative to the IMA Hound 125F Glide. I can’t prove it, but it does seem like this copy casts a touch better again, and it also comes rigged with proper quality hooks and split rings. I wouldn’t usually do this, but with the IMA Hound 125F Glide being discontinued, this cheap as chips HTO Search ripoff seems to be a valid alternative. It flies, it grips, but does it catch bass as well as the original? Make sure to throw the hooks away and put decent ones on. The IMA Komomo SF-125 (125mm, 16g, 0-30cms swimming depth) runs with a loose, wiggling/side to side action that really turns fish on. I just don't go bass fishing without at least one SF-125 in my lure box. I wrote a blog post about this lure - see here. A long casting, ultra-shallow diving lure from IMA, one of the best lure companies out there. A lure like this needs calm conditions to work best, for it really does swim so shallow that too much chop on the water will kill it stone dead. This IMA Komomo II (110mm, 15g) is a killer in calm, settled conditions over shallow, rough ground especially. You can find UK stocks of these lures here and here. I just like the action on a Sasuke lure, and this little 105mm long model casts really well, grips in great, and gives me plenty of that Sasuke kind of action in a smaller lure. I can get this Sasuke 105 (105mm, 13g) up fairly shallow if needs be, and as with the other models on the range I tend to retrieve this 105 with a straight retrieve on a medium and sometimes slowish kind of pace. You can buy this lure here on Ebay. Although this little lure sinks, it’s easy enough to fish it over shallow ground where I think it’s going to do so much harm - as long as you whack the bale arm over when the lure lands and you don’t let it sink, this Rocket Bait 95 comes up nice and shallow almost immediately. You can cover a lot of ground with this lure because it casts so far and my initial impressions are good - see here for example. The first time I ever used the Sasuke 120 it caught me a good bass in the most horrendous conditions. An easy lure to get fairly shallow if needs be, and that action just does it big time. 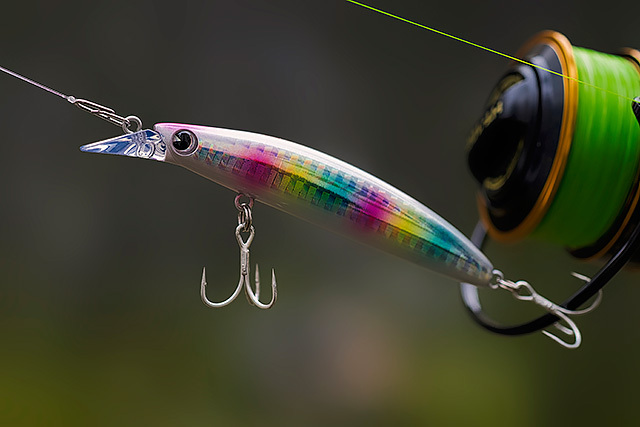 Both Sasuke 120 lures are 120mm long - the floating version weighs 17g and the sinking version weighs 18g. Read a blog post about these lures here. The IMA Komomo lures do it for me in a big way, and this smaller IMA Komomo SF-110 (110mm, 12g, 0-50cm swimming depth) is a stunner. Casts well, swims lovely and shallow, and the action is sublime. I simply have not used this smaller SF-110 as much as I should have, and this error is going to be corrected. You can find UK stocks of these lures here and here (Ebay link. 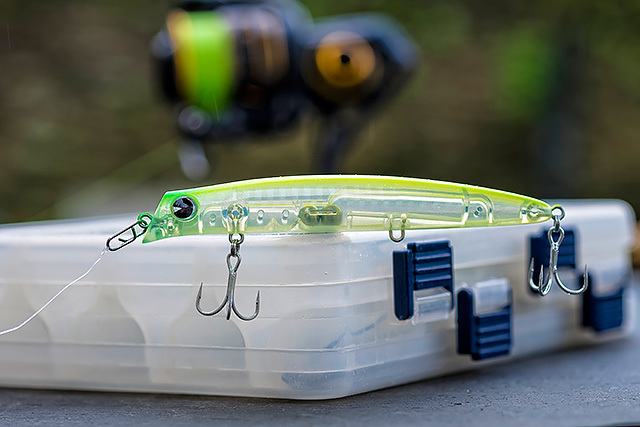 The IMA Sasuke 140 (140mm, 20g) works really well if you simply crank it in at a medium to fast pace, and the lure tends to run with a really seductive, tight “wiggle” action at a kind of medium shallow depth. You can easily make it swim shallower if you need to, just hold the rod tip up as you retrieve. Responds very well to a very animated twitch/pause retrieve style as well. The IMA Sasuke 140 casts really, really well, especially into and across the wind. You can buy this lure here (Ebay link). What on earth have I been missing? Swim this little IMA Calm (110mm, 11g, sinking) nice and slowly and you can’t help but think sandeel. I am kicking myself for not using lures like this properly, and I intend to rectify this big time. For its size this IMA Calm casts very well, and yes, I just want to jump in the water and eat it myself when I start the retrieve. Another lure to put in an ever-growing lure box! You can find UK stocks of these lures here (Ebay link). The IMA SF-130 Slim weighs a mere 12g and is 130mm long, but you would be surprised at how well it casts, and if you can track them down then have a look at the very slightly heavier, limited edition IMA SF-130 Slim Tomahawk which weighs 13.5g. This thing flies out there like you might not believe an ultra-shallow minnow can. The IMA Komomo II 90 (90mm, 12g) is not just a smaller version of the slightly larger Komomo II that I presumed it might just be. No way. This is a whole lure all by itself if that makes sense. Small it might be, but it casts incredibly well, and what really surprised me from the off was how well the 90 “bites in” to the sea – and especially in rougher conditions when I would not have used the original Komomo II. This is a pretty substantial shallow diving hard lure - the IMA Komomo SF-145 (145mm, 26g, 20-50cm swimming depth) casts pretty well and it’s also nice and stable in some lively conditions. You know the sort of action you’re getting with this Komomo SF family of IMA lures, and I love it. I catch bass on these lures and I can’t ask for much more than that. What on earth have I been doing letting this little IMA p-ce 100 (100mm, 17g, sinking) sit here for so long with so little love? It casts very well, and although it’s a sinking lure, the moment you start the retrieve this IMA p-ce 100 is right up there, literally just underneath the surface with the most outrageous wiggle kind of action on it. I have been a fool for not giving this IMA Sasuke 130 (130mm, 25g, 80-120cm swimming depth) more time, and this is going to be rectified. Long-casting, very “grippy” in tough conditions, and it’s got a very exaggerated Sasuke kind of action. I know of a few bass anglers who have done so well on this IMA Sasuke 130 and I will be carrying it more and more for lively conditions especially. This sinking version of the already-killer IMA Sasuke 140 is everything I had hoped it might be. If I have a sniff of being out and about in heavy conditions then this one is in the box for sure. Talk about biting in hard when it gets lumpy, indeed I can’t get the seas I fish to spit this thing out, and if the lure is working away all the time then I feel that I am in with a decent shout at some fish. You can really punch this IMA Sasuke 140S (sinking, 140mm, 21g) into a headwind and still cover stacks of ground. You can imagine that I was a little excited to find out that this smaller IMA Sasuke SF95 (95mm, 8g, floating) was described on the IMA website as being a very shallow runner. Me and my shallow divers, so I got hold of this lure and again caught on it almost instantly over some very shallow rough ground in less than ideal conditions. A little lure with big intentions, this IMA Hound 80S Sonic (80mm, 9g, sinking, 60-120cm swimming depth) gets out there really well, and it can grip into some surprisingly lively conditions. Time will tell how this works for bass, but with how much time some of the other IMA Hound family spend in my lure box, I see no reason why this one isn’t going to do some good business on the fish. Long-casting, just sub-surface with a stunning little waggle/slalom type of action, I have so much to learn about these lures. This IMA Honey Trap does seem very versatile with the different ways you can work it, so don’t just wind it in. Play with it! I just don’t understand how IMA can get a “little” lure like this Hound 100F Sonic (100mm, 14g) to cast so well and also grip into the sea like it does. This baby of the Hound 125F Glide has a bit more of a vibration to it when you retrieve it, as in you can really feel the intense action through your rod tip, and it swims a little shallower as well if needs be. Not quite as long casting as I thought it might be when compared to the smaller missile like IMA Hound 125F Glide, this larger IMA Hound 140F Fang (140mm, 22g, 40-100cms swimming depth) still gets out there pretty damn well, and it just eats into rough seas and keeps you fishing. You can find this lure here (Ebay link). A killer, very long-casting floating minnow that has an awesome action and catches fish. I actually lost the largest bass that has ever hit me when I was using the red belly version (code NB009) of the IMA/DUO Nabarone 125F (125mm, 16g) – my braid was taken across sharp rocks and broke. 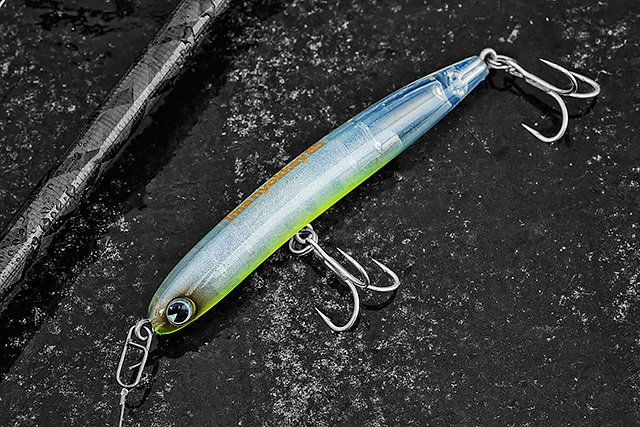 So many of these modern Japanese lures cast like bullets and this one is no exception. This thing is ridiculous. A small hard lure yet it’s a missile how well it casts, and when you slow to medium straight-retrieve this little IMA knokkey85 (85mm, 11g, 15-50cms swimming depth) it sits a little head up/arse down in the water and just wiggles. Crumbs. 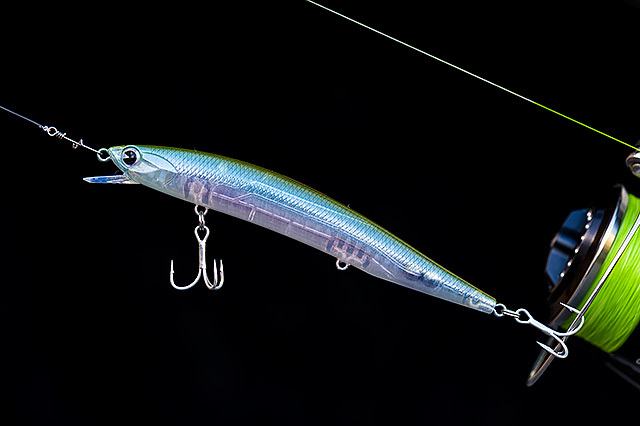 I love the idea of this lure on a light rod, searching around estuaries and calm conditions when something small, subtle, and yes, wiggly, is going to do it for the bass. The sinking version of the IMA/DUO Nabarone 125 might only weigh a mere 1.5g more than the floating model, but for some reason it just flies out there even better than its floating counterpart if that is possible. This IMA/DUO Nabarone 125S (125mm, 17.5g) is now one of my go-to hard bass lures for tougher conditions.